How would you like to live in your house for free? As in, it pays for itself. Depending on the property, it is completely doable. I love property and love looking at ways you can make money from property either by having an investment property or using the property you live in. When looking at homes I look for the potential to make money from it to reduce the rent or mortgage payments and in many instances I have worked it out so that I would be in profit after expenses such as rent or mortgage. Here is an example of what I am talking about, then tips at the end on what to look for and how to do it all. Hint – the floor plan is crucial! Also, if you are doing any sort of estate planning, speak to professionals such as Ascent Private Wealth, for the advice. How you can make your home make money for you! I used to live in this house and was originally going to buy it before I had serious health issues which cost a fortune then I moved interstate. It sold recently and is the perfect example for what I am talking about. This home has 4 bedrooms, 2 living and 2 dining areas in the main house plus an ensuite and walk in robe to the master bedroom. It has a one bedroom granny flat attached, a swimming pool, large driveway and yard. I rented out rooms, used AirBnB and had other options when I lived here. There are at least 4 scenarios, each putting you in profit with a home like this. The flat rents for $300 and the house for $500 – $550 per week. The electricity and water are combined for the properties and previously it has always been upstairs that pays for them both. If you are living in the flat, renting out the house, it pays for itself. See the table below. This can be a great option for couples or singles as the unit is completely self-contained. 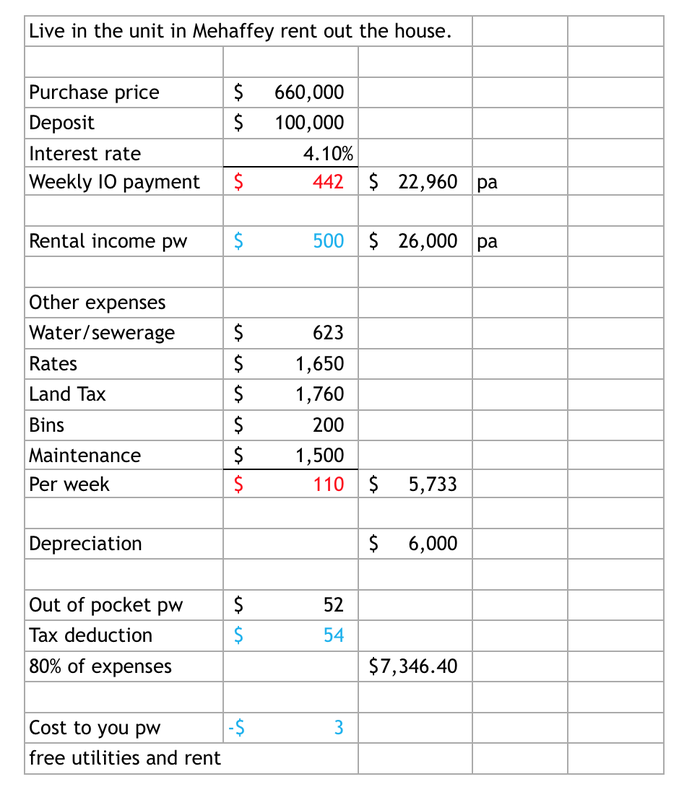 You can download the spreadsheet to play around with it, different interest rates, rental rates and so on. I lived in the main house with the flat rented to someone else. I rented the master bedroom out for $200 to $250 per week and at other times rented other rooms for between $150 and $200 per week as well. Realistically this house can be split into two with only the bathroom and laundry shared because of the design of it. 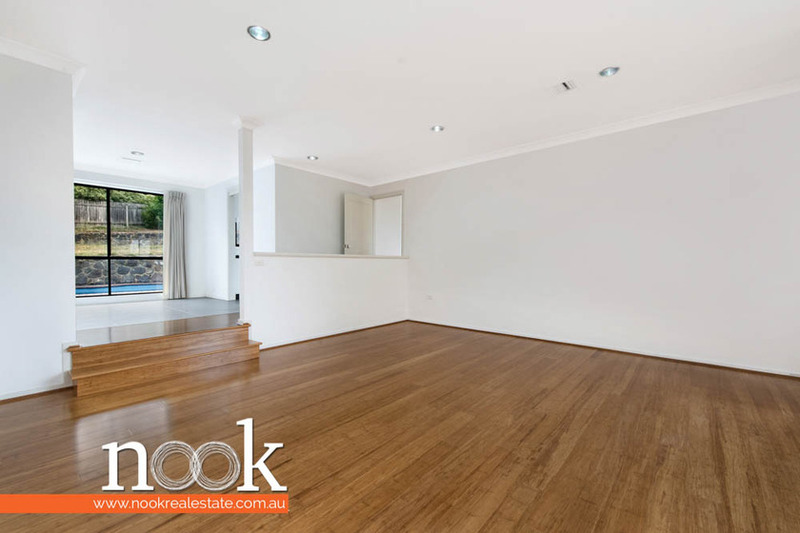 You could easily rent the flat and however many bedrooms you wanted for a total of $500 (flat and one bedroom) through to $950 (flat and 3 bedrooms rented long term). Alternatively, if you rented rooms through AirBnB, I have rented them for $50+ per night, which nets you more than a long term tenant. Few tips on AirBnB – there are services now who will come in and clean after a guest leaves or prepare everything before a guests arrival for you plus you can charge a cleaning fee on AirBnB to cover this. Many people use a lock with a changeable code to store the house key, allowing guests to come and go without you needing to be there. AirBnB has insurance, but check with your own insurance as well. I have had experience both as a guest and host. Their customer service was brilliant, issues resolved quickly and I have preferred it over a hotel every time. Set some rules such as no parties, no smoking etc. Be clear on what is and is not allowed. Also, check reviews of people before allowing them to book with you. Trust your gut. Most people are good and will take good care of your home and it will be a breeze. Be impeccable with cleanliness, providing the basics and be easy to communicate with. Overall, you can make a lot more with AirBnB with a little effort, much of which can be outsourced now. It fluctuates though. If you prefer to know exactly what you are getting each week, get a long term tenant instead. You can have it as a total rental property renting both the flat and main house while you rent elsewhere. When I lived there the front main lounge was also a studio. We had chairs we could set up, a large wall mounted TV and did workshops on social media, photography, marketing, blogging etc. This provided various work from home options and made part of the house a tax deduction. With any property there are other options aside from renting a room or making it a rental property. Rent the pool to a swimming or fitness instructor, rent the driveway to someone to store their boat or caravan or check out other options here. Making money from property doesn’t have to be complicated and if you look with an open mind, thinking outside the box, there are many opportunities to be found! A floor plan with potential and lots of options is essential. I want to be able to have some privacy, alter the floor plan slightly by doing something such as putting up a wall to create an extra bedroom and things like that. As you can see in the floor plan on this home (see below), there are many options. 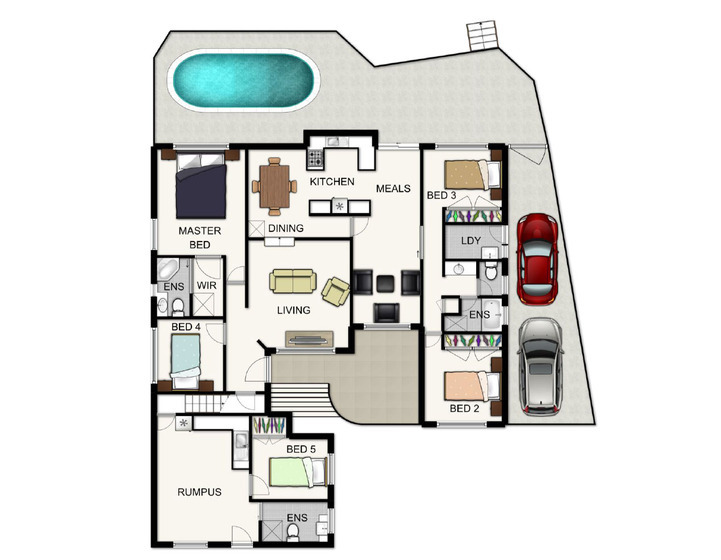 On this floor plan (created by the real estate) the rumpus room, 5th bedroom and ensuite at the bottom are the granny flat. The living area with the green lounges in the image was our studio. The dining room next to the kitchen has at different times had a wall put up, making a 5th bedroom, which you could also do to the area with the black lounges in the floor plan, creating extra bedrooms if you wanted a large share house or more privacy. A floor plan with multiple options like this is essential if you want to make your home pay for itself. How much space is in the roof and can any of it be turned into an attic? If you want to extend down the track are the spaces within the home that would easily accommodate stairs without interrupting the flow of the home? As an ex hairdresser, I looked at homes and specifically wanted space in them I could convert into a salon so I could have a salon at home. This didn’t end up happening, however it did make me think about what else homes can be used for. Think creatively. I have rented my garage to a small business owner who needed space to sew and leave her designs set up. She didn’t have it at her home, so she rented my garage. Other people have selected properties that are large enough they can put a caravan or storage shed on the property to rent it out. With the space your property has, what can you do with it? 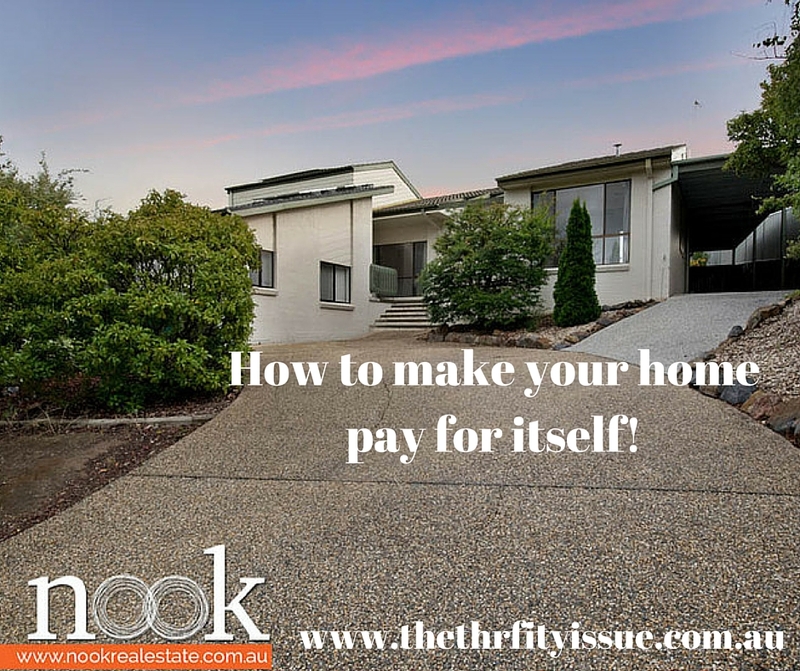 Theoretically, with the home I have used as an example in this post, you could earn over $4000 per week if you maximised every option. Remember, this is theoretical, not guaranteed. Also you need to check insurance, council regulations and so on before embarking on any ideas. Run workshops – if you have skills in any area you can fit up to 15 people in the front lounge room to run workshops on anything such as social media, marketing, blogging, photography or 5 – 10 if you wanted to do crafts, cooking, singing, instruments, tuition etc. At $50 per person you could easily make $750+ per week doing 1 workshop a week. Rent the pool to a swim/aerobics instructor – they can pay you a flat fee for use, it can be accessed via the side of the house so they do not need to disturb you. Set up a contract with times it can be used, terms and conditions plus insurance details. From my research, most charge $60+ for 30minutes of at home lessons for up to 4 children. Check with council regulations if this was an option you went for anywhere though. If you asked for $10 per hour or $10 per session and they did 10 hours or sessions a week that is $100 minimum. 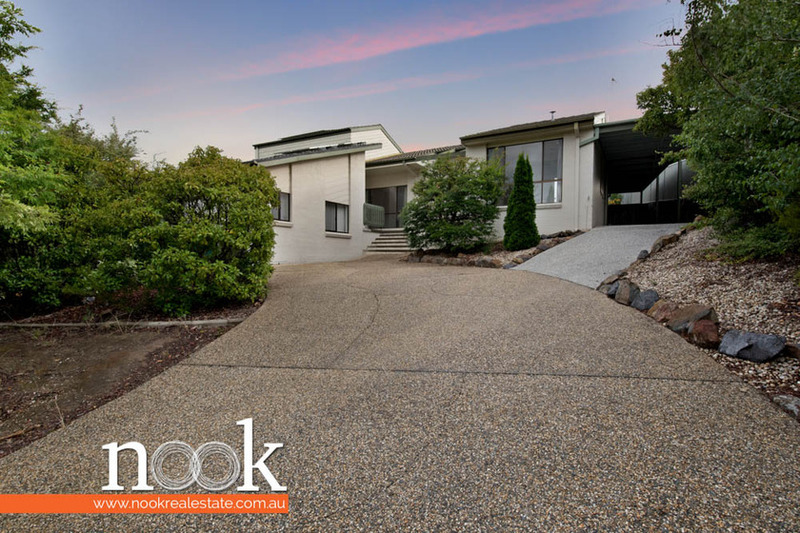 Rent the driveway – With this house, there is ample space for a caravan in the driveway or boat in the carport, along with parking across the front. The most cars we had parked here was 10 (driveway and front lawn, so completely on the property. You could make from $40 per week for renting some of the driveway or carport the space for storage for a boat or caravan. Of course, the simplest option is to live in the granny flat, rent out the house and let it pay for itself without much effort at all. How have you made money from a home? Disclosure – I don’t own this house was not paid to promote it. There is a paid link for Ascent which was placed long after this post was written. My parents own the house and it is on the market. To me, it is the perfect example of a house with multiple income options for investing long term. I asked dad if I could write about it in this context. The images are from Nook Real Estate. The reason my parents sold it is they have had the home for years, it was the family home at one point and they wanted to let it go and move on with the next stage in their life. That’s such a beautiful house! Multi-units can really bring in a profit if done right. I love how you made use of that space as a studio, too! We loved the studio. It had so many uses and saved a bunch of money. Never have I even imagined that you could rent your pool out to a local swim instructor to hold classes. That’s an incredible idea! One of my friends did it for a while and loved it. Best to confirm firstly how a granny flat can be used. Some councils state that a granny flat can only be used by a member of the owner’s household. Hence, renting it out to non-family may not be allowable.